Ok! Month 3 and I've finally got some stuff painted.. not a lot.. but some! So my first fully painted unit is the Everchosen Chaos Warriors. It's been quite difficult to make them 'pop' with such a dark palette but I'm happy with the result. Now they're finished I'm wondering if I need five more.. damn it. They do die quite quickly. Also got my Slaughterpriest finished. Such a great model this and he's great on the table too. So much so I've already bought the alternative sculpt too. Two is better than one after all.. I really but some effort into the Slaughter Priest as he's going to be an entry to Golden Demon this year.. hence going a bit overboard on his base! The basing is how I'm going to do all my characters and monsters.. so I'm having to make sure I leave plenty of spaces for icicles. So that's all I've got painted but it's a start. 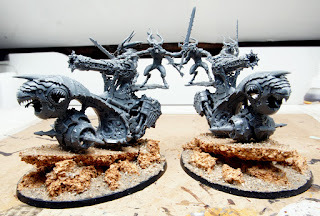 Realised I needed some shooting in my army so I bought a Skull Cannon.. it misses almost every time.. so I bought another one.. still no luck.. but they look cool! Looking forward to getting some paint on them, maybe that'll improve their luck! I will let you know next time. Oh! Almost forgot! 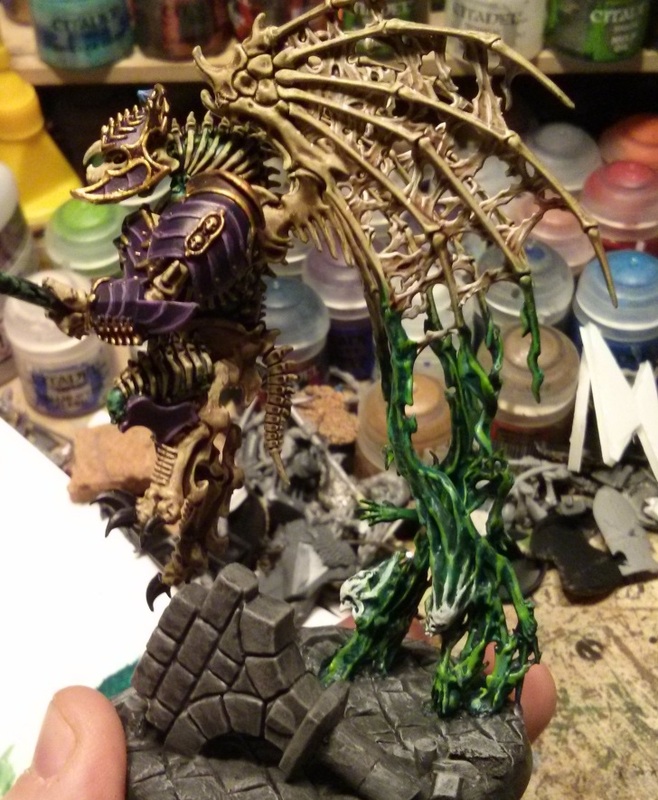 Finally got started on Archaon himself! Well his mount anyway. Took some time to get 2 of the 3 heads done. 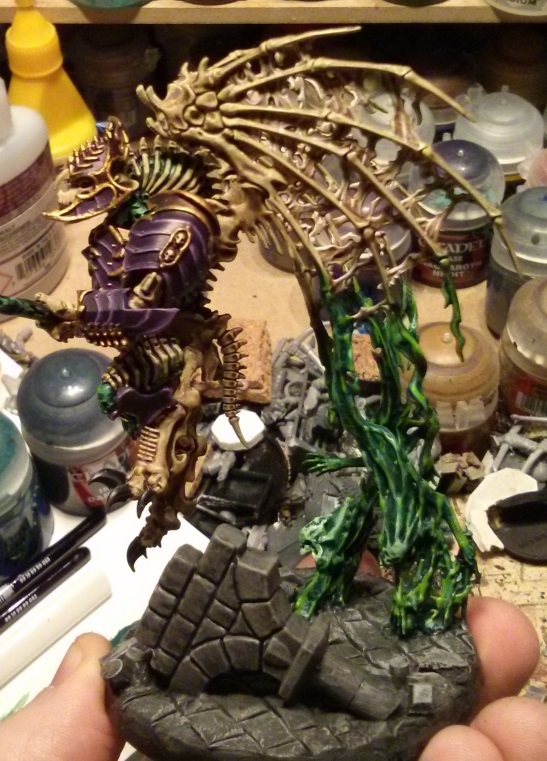 Just the Tzeentch one to do.. and then the rest of the massive thing. So, April has been a busy month for me, both work- and hobbywise, so fasten your seat bealts and get ready for a long post! With the release of Grand Alliance Order I decided to focus on the newly revamped Devoted of Sigmar and bring my version of Johan & Wilhelm, mercenary Witch Hunter and Warrior Priest, to the Mortal Realms. For my version of Johan, the Warrior Priest, I took a flagellant body, greenstuffed the armour and added hammer, shield and a book from my bits box. 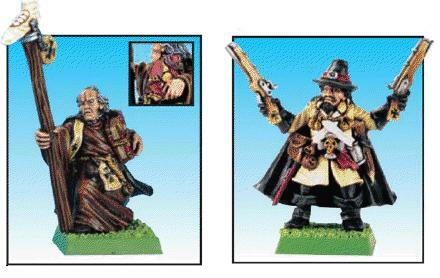 Since you can have 4 Witch Hunters in a Mordheim warband, Wilhelm turned into four models. For them I started from the Militia kit, only using the torsos with long coats and the legs with boots, greenstuffing hats, gloves and extra details on the coats. With the heroes done it was time to move onto the grunts. Since I had used one flagellant body to convert Wilhelm Glaubig, I needed to replace it to have a 10 model unit of Flagellants. Legs and torso from the Militia, a little greenstuff, head and arms from the flagellants and I had a unique Prophet for the unit. The rest of the Flagellants were very simply straight out of the sprue. 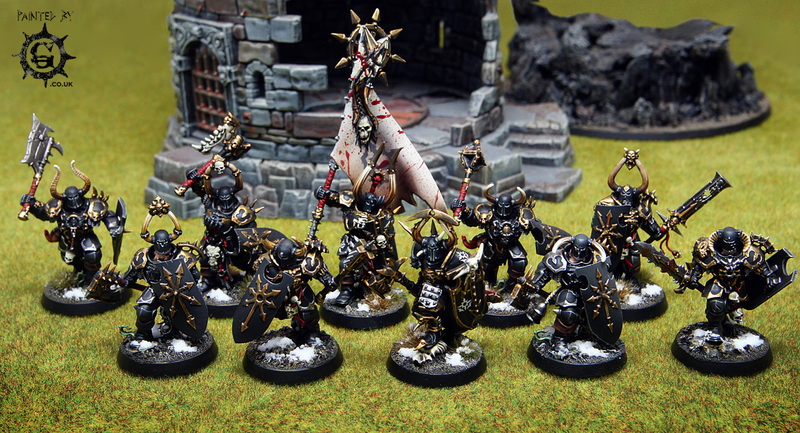 And finally, I was left with 15 Militia models to do the Fanatics. I wanted them to look like a mixture of veteran soldiers and hungry peasants roused to wrath by the fiery oratory of the Witch Hunters, so for some of them I have used the arms with torches and scythes from the flagellants. You can see that the unit leader is rather different, and that's because I wanted him to double up as a Pit Fighter for Mordheim games. He's made using bits from the Flagellants and Militia, but with some extra details I have greenstuffed. Talking about Hired Swords for Mordheim, I also wanted to have a Slayer and that's why I looked for the 2014 White Dwarf model, the vampire hunter one. Simply painting his hair and beard orange was enough to turn him into a Slayer/Unforged. Last thing left was to include some Warhounds for Mordheim. I turned to my bits box and found a few pet griffons from some Empire kits, so I simply stuck them on round bases and painted them. 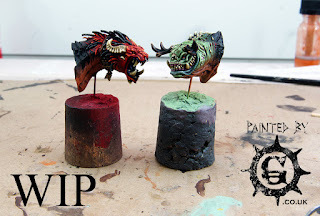 In AoS I'll use them as gryphounds. Granted, they are way smaller than the official model... but as much as it is easier to hide them, the area of the table they cover with their effects is way smaller, so I guess no one will really complain about them. And that's all from me for this month! For the next get ready for something heavily destructive! The Realm of Life can probably rest easy given the length of time it's taking me to put this lot together, but I think I'm getting there - mainly thanks to an upcoming tournament! 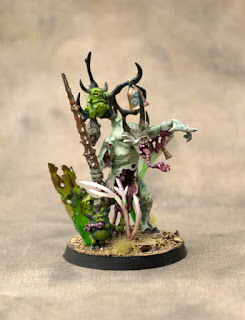 The tournament has caused me to rally a wider selection of Nurgle units, so that's the key problem at the moment. 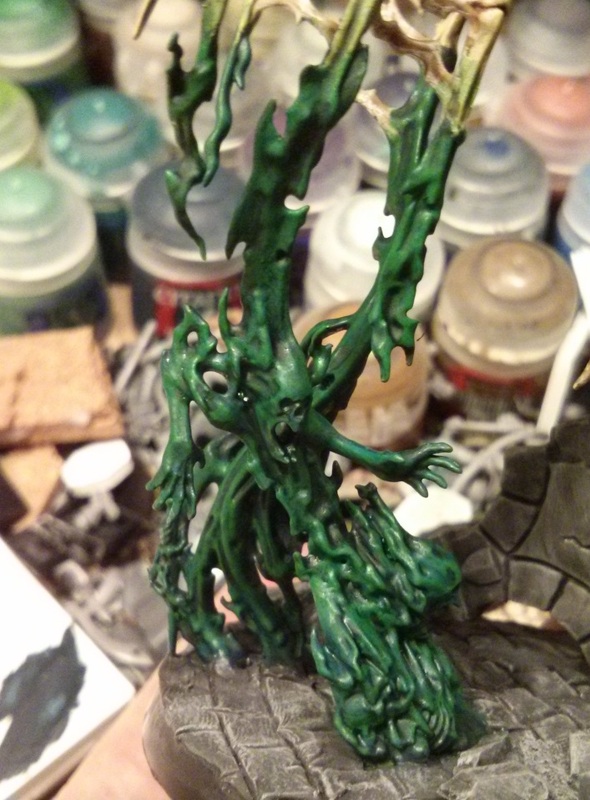 Still, Nurgle's easy to paint. Isn't it...? 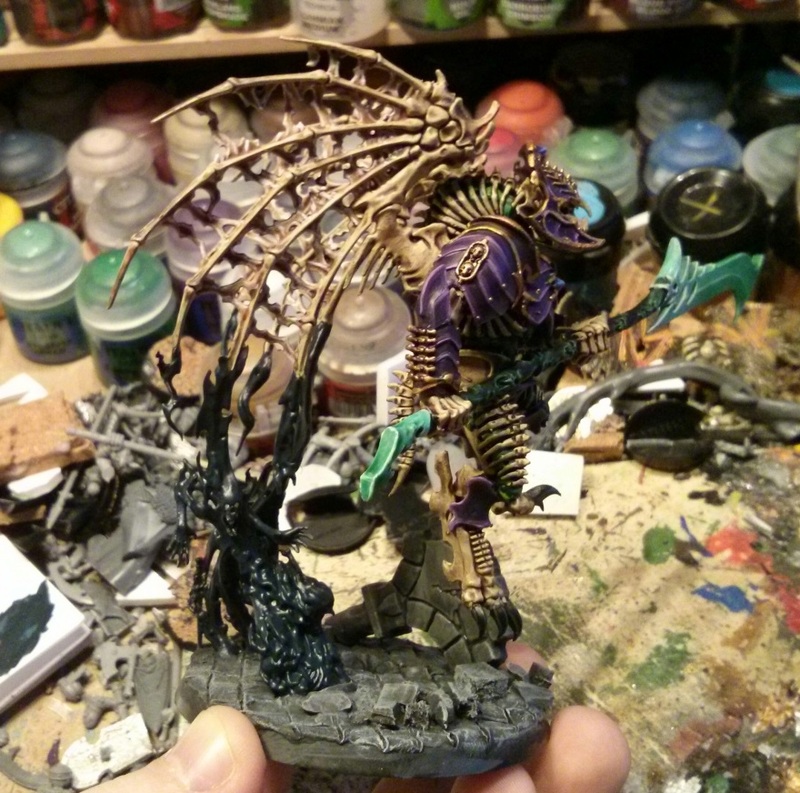 So in addition to the Daemon Start Collecting box I began with, I've added the Glotkin and a Maggoth Lord to the workbench. I've also purchases a second Start Collecting box, though the Herald and Nurglings from this one were for a wee conversion job - my own take on Epidemius. I'm not a fan of the GW model (£30 for something that looks like it melted before being molded), so I thought I'd take a crack at my own version. Also, I'm running a list with two Plague Catapults to rack up lots of wounds early doors - so I think it's only polite to make Epidemius look as cool as possible, and to make him fairly easy to spot and shoot at! 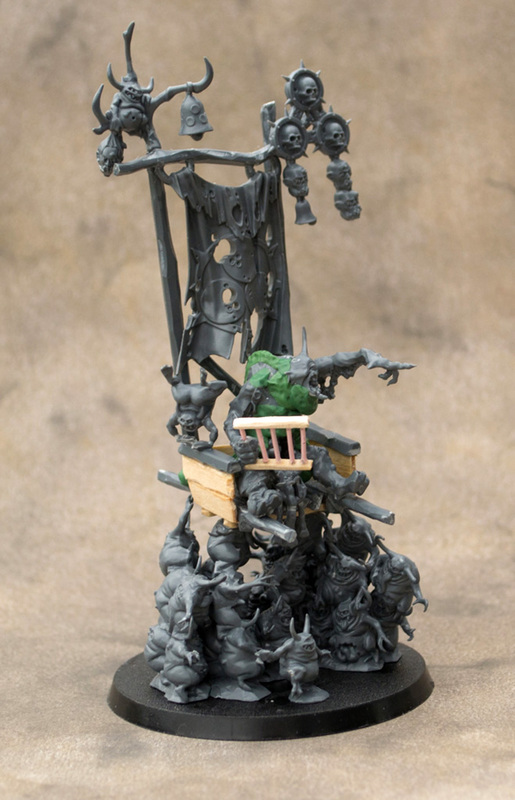 The palanquin is scratch built from balsa and sprues, with the "bum flag" from the Glotkin model as a banner. The thing in his hand will be an abacus (I've since greenstuffed it, and it does look more like one than I feared it might). On the whole I quite like the size and sense of balance on it, so hopefully it'll look okay painted. The Maggoth Lord was already constructed, so I just had to paint him up. 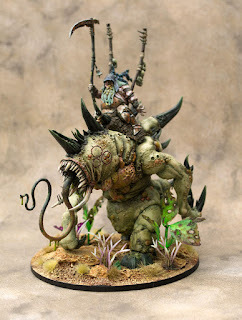 The upper body of the rider is magnetised so I can run it as any of the three Lords, but after a few games I think Bloab brings the most to my army - he can cast two spells, and his shooting attack is quite good as well. 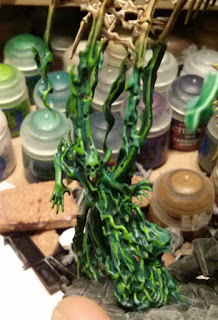 You can see the Realm of Life basing I've gone for - the plants are aquarium plants that I've melted holes in and ink washed to look diseased. 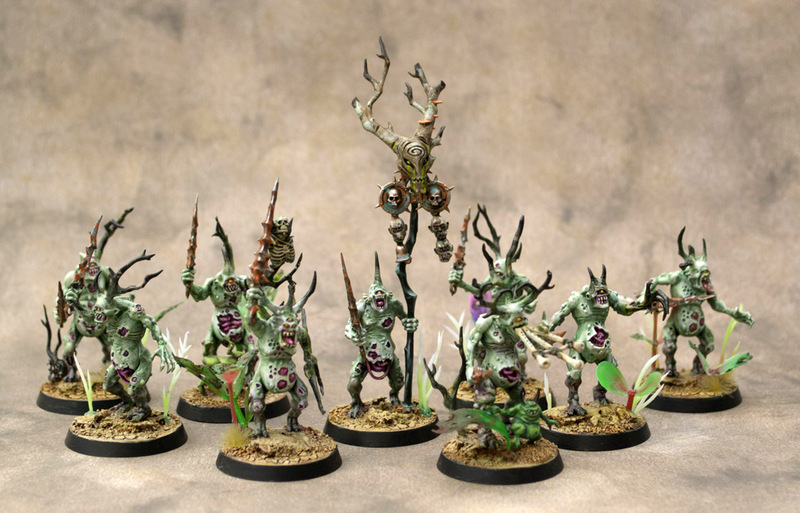 And here are all the finished Plague Bearers and the Herald. 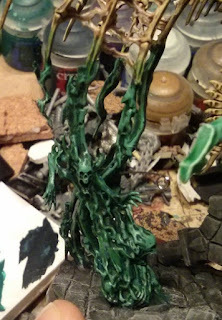 I'm going to try and add another ten Bearers for the tourney, but that seems unlikely at the moment - the Glotkin is built but I've only just started painting him/it/them, and I think it's going to take a while. 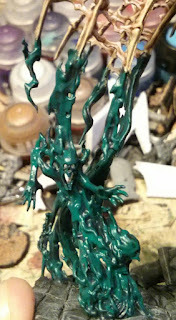 I enjoyed doing the bases for these, but it is another time consuming stage, so I may have made a bit of rod for my back. Also now, with the Grand Alliances, it does kind of mean I should base all my Chaos units like this, and I'm not sure it suits every army. I might stick to the same basic colour and textures, and change the foliage/debris to suit the different marks of chaos. I also have three Drones that are nearly done, so I should be able to post those soon. Other than that I have some re-basing to do on my Blight Kings, and my second Plagueclaw to paint up. And just a little over three weeks to the tourney... oh dear, I've got some work to do. Like the rabbit from Alice in Wonderland, I'm LATE !! This won't stop me, though. As said in my last post, I was away from home in March, and then hoped to catch up in April. 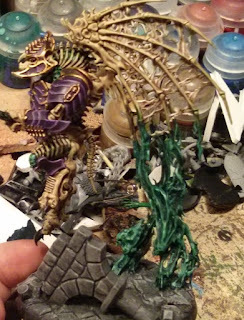 Unfortunately I was slow to get back to my painting station, and a double combo league/tournament showed up for Warmachine, which is chaining me all April long on PP models. Damn it ! My March miniatures are therefore still WIP (see below). They do have at least three colors if I want to force them on a battlefield, but that's it... And I haven't started on my April goal yet ! The good thing about Stormcast is that you don't have that many models, so below is my added target for Month 3, which will come on top of my Month 2 miniatures. 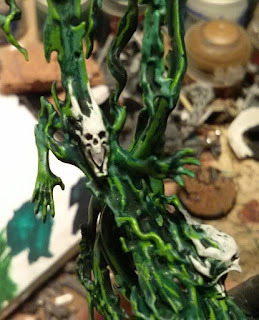 I'll paint everything in May, along with Month 4... I know that it looks like a slippery slope, but I'm pretty confident that I can make it. So May will be all about AoS ! Yes, my target for April is one hero and a piece of scenery. Why scenery ? Because the Baleful Realmgate is part of one Warscroll Battalion, The Wardens of the Realmgate. 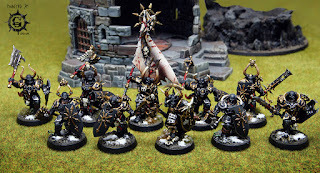 It includes 1 Lord-castellant, 1 unit of Gryph hounds, 1 unit of Protectors, 2 units of Liberators and the Realmgate. Once I have caught up with all my painting, I'll have everything needed to field it. The Wardens of the Realmgate warscroll is the core idea behind my whole Stormhost, I believe it might even be the batallion that gave me the idea for this army concept (and probably influenced me a little bit on the name?). It was therefore obvious that I should start this Bataillon as soon as I had finished the starter set. 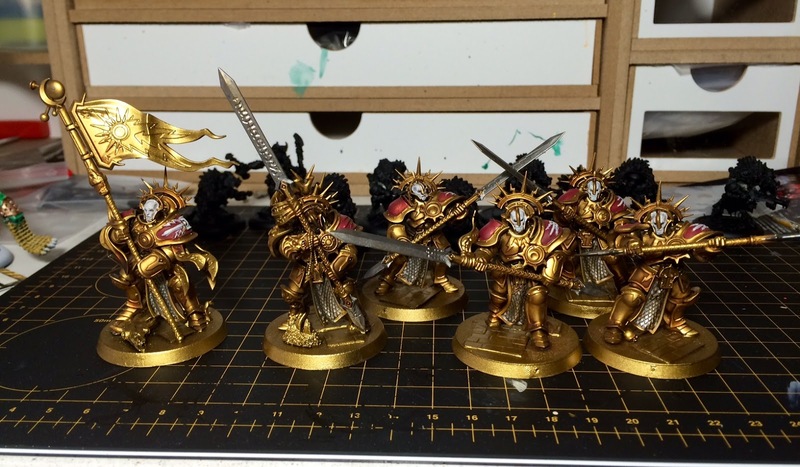 Because of the high cost (in $) of Stormcast Eternals, it took me 3 months to gather the miniatures needed, but now it's there ! 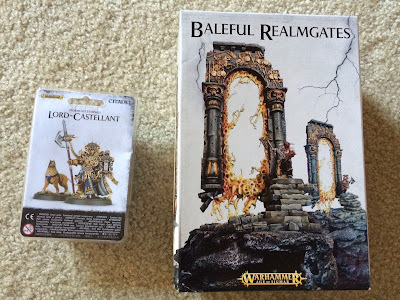 I'll paint the Realmgate in the Beast realm colors, as this is the first chamber I'm depicting in the Rise of Empires blog stories (I'll also try to catch up on my writing there). 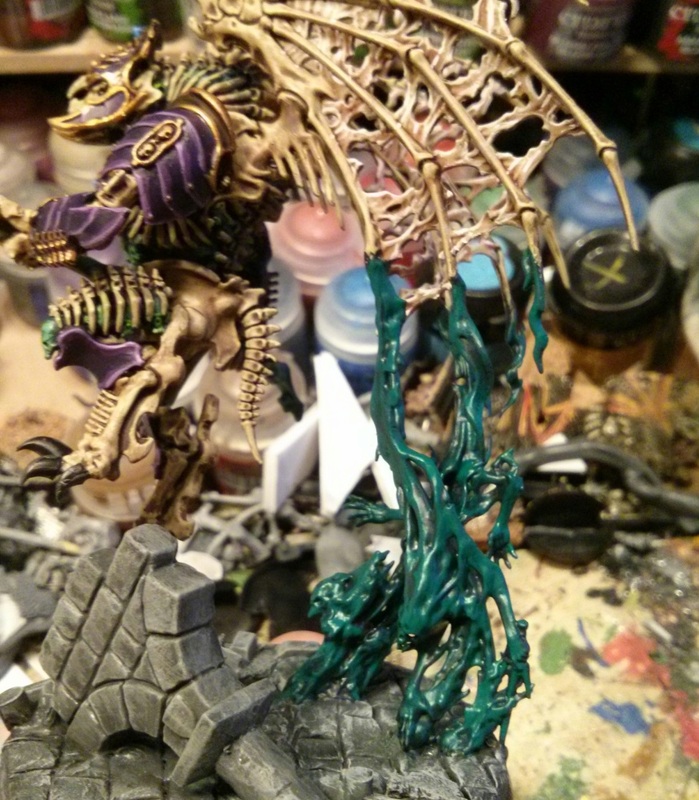 I'll see you in May then, with all this stuff painted on top of my next monthly target ! Hey guys. Been a while. 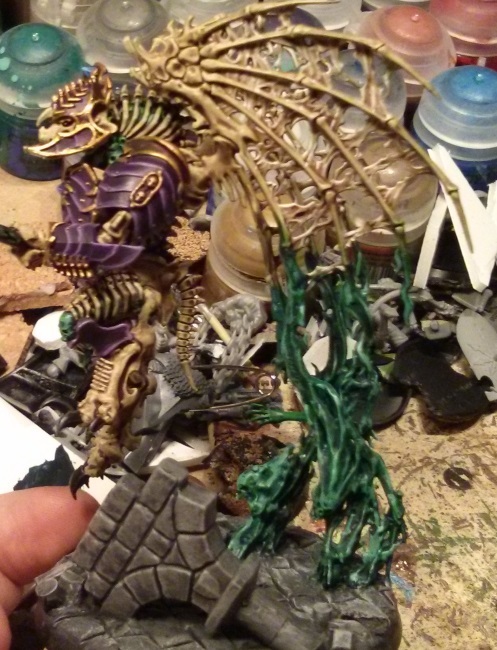 SCGT came and went, and I got a bit distracted by that. So to get back into the blogging groove, I made a little guide. Undead energy has always been green, to me. I wasn't pleased with the official light blue-green spirits, so I made my own scheme. It is supposed capture the magical power of the spirits. Got a few questions of how I did my spirits, so I decided to make a little guide. Starting off, let's look at the paints. These are in reverse order, oops. First up is the base layer. This is all Incubi Darkness. Just cover everything you want to be glowing and green! 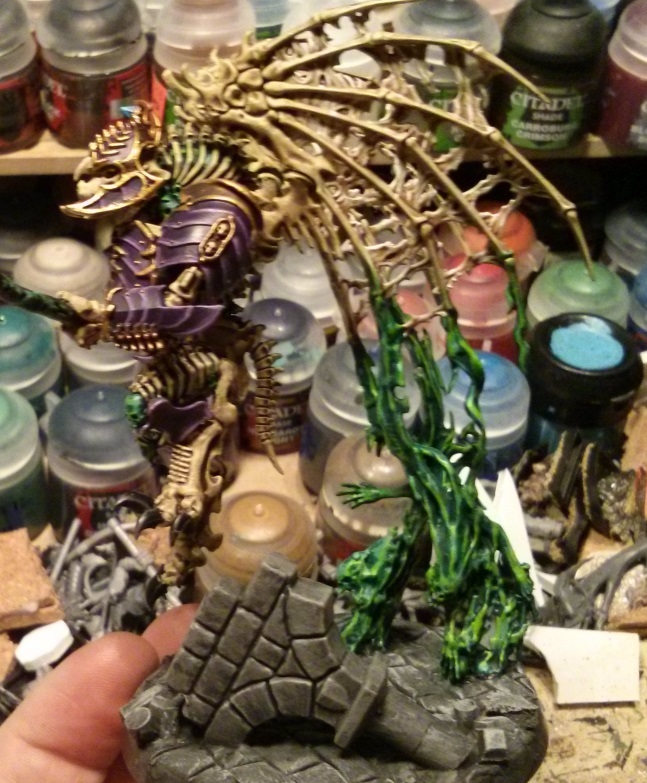 Next up is Kabalite Green. Just splash it on there. I call it "wetbrushing". 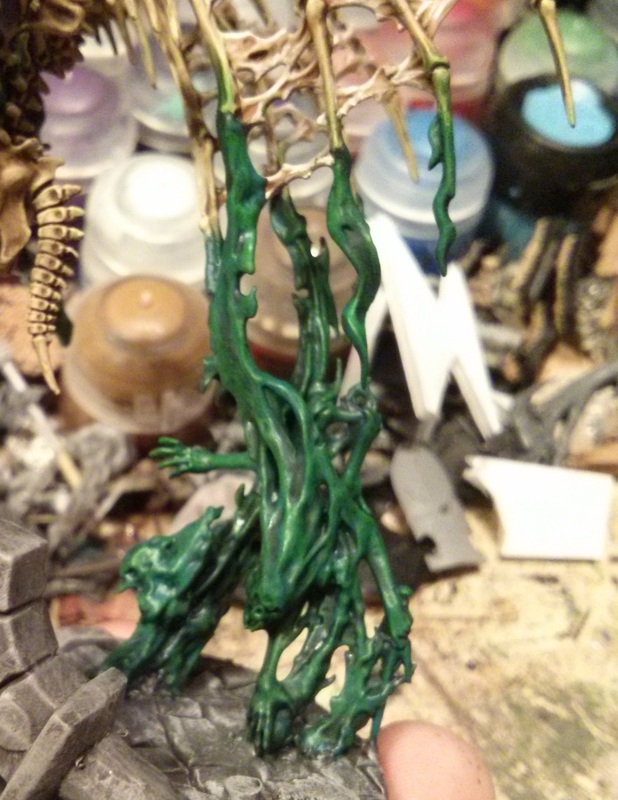 Sorta like a drybrush, but with a lot of paint on the brush. Read it off some GW guide some time. Used a M layer brush from GW for speed. No need to be careful, really. Make sure you paint across the entire base layer, if you want to blend we can do that later. The only thing you want to avoid is the deepest recesses. Also, don't use so much that you start losing details. That's also important. The third layer is Warpstone glow. Kind of the same deal. Just wetbrush the stuff right on. Just be a teensy bit more careful here. You'll want to be able to see all three colours, more or less. No need to worry about details. Spirits are pretty random. As long as the colours largely conform to expectations, it's no issue. Next up is the wash. Get out your Biel-Tan Green. Apply directly to model. Work it into every detail. This will give your spirit a nice blended green tone from dark to bright. Take a little care that it doesn't pool too much though. You'll get bubbles rather than blends if it does. Wash it all, then go over with a clean brush to soak back up some of the excess wash. Bonus tip: if you want to blend the energy into the rest of the model, this is where you do it. 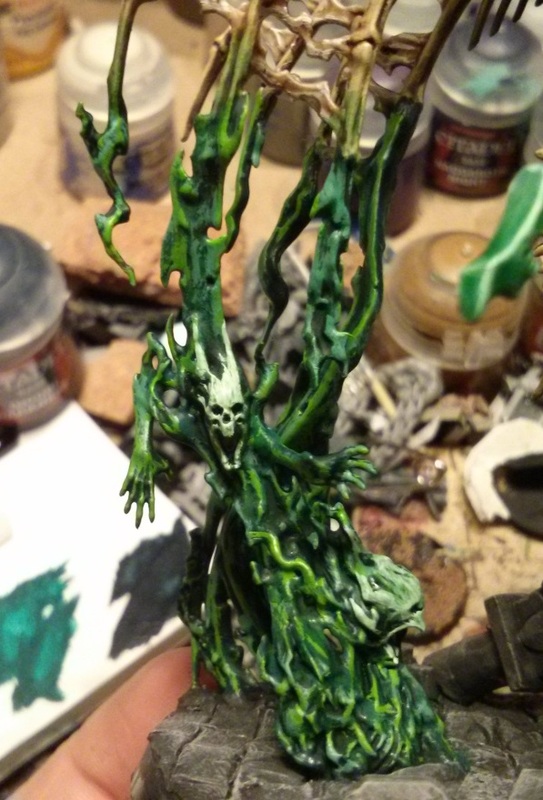 Put a little of the wash over the non-spirit model. Once that's dry, thin out some more Biel-Tan, 3:2 Biel and thinner. 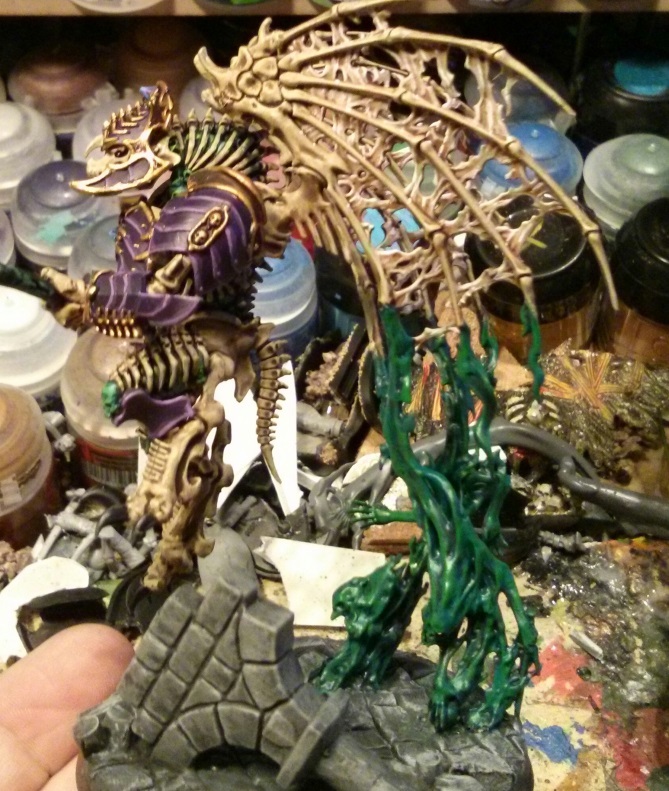 Put this quite far up on the model and all the way down to the spirit. After drying, put another layer of the same a bit further down, and repeat even further down for the last. Should give you a dark, smooth transition. You're half-way! Four layers and four different paints. Your spirits are looking suitably random, but now it's time to push the quality up a notch. If you're speedpainting, you could end here, but don't. You won't regret it. 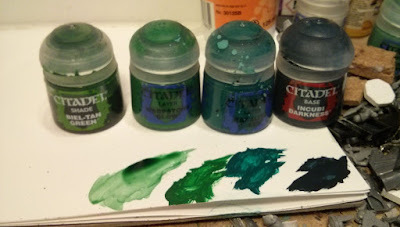 Now it's time to crack out a sharper brush and the Sybarite Green. I used a S layer brush. What you want to do here is highlight all the raised edges. This will really define the spirit energy, whilst the sybarite gives it that eerie colour. Be especially aware of the face and arms. The "head" should clearly stand out, so give the "hair" a nice, clear line of paint. Keep it to the raised area though, you want that depth in between the hairs. This stage is a lot more work than the previous ones, but is very rewarding. This is where it goes from "swirly green stuff" to "undead energy". Last layer for most of the model is coming up! Get out the Moot Green. Pick out all the little lines all over the place. 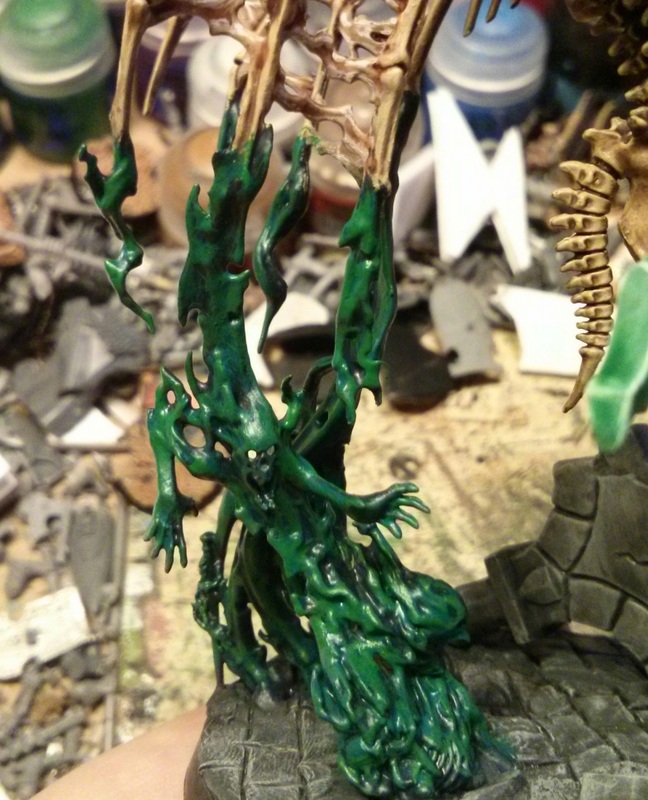 Make sure you're painting in the same direction as the model is flowing. Be careful how you pick out details. Don't be afraid, but make sure that only raised areas get any paint. Finding little raised bits within recesses is nice though, so give them a little highlight too. Lots of little stuff like that, so be vigilant whilst you paint. Once you've done that across the entire model, you're done! Almost. The spirity part is done, all nice and green and creepy energy. Just one more bit to go. 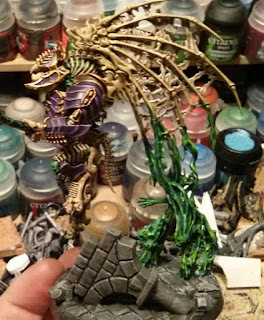 Grab that Ulthuan Grey. Here you just want to put in on the face and "hairs". Don't overdo it, just a little ways back from the forehead. Enough to suggest a special coalescing of energy, but not enough to be anything of its own. This layer really highlights the face and makes it stand out. Make sure to get the mouth as well. Last step is to re-wash the faces. Biel-Tan is the answer. This blends the face in better, and gives it that green tint. Now the face is clearly visible. Really drives home the "spirit" part of the spirit host. There's a soul here, trapped in the mortal realms.